This program requires a PC equipped with Windows® OS and Adobe® Photoshop® version CS or higher ( up to CC 2017) for the PC version. And an Apple Macintosh® computer with Mac OS X® 10.7 or higher and Adobe® Photoshop® version CS or higher (up to CC 2017) for Macintosh version. Run Adobe Photoshop and load the file Sample_composite.psd available at the Documents\Auto Class Composite\Sample folder. Select the folder Documents\Auto Class Composite\Sample\Teachers click on Fill Composite. Select the folder Documents\Auto Class Composite\Sample\Students and click on Fill Composite. Copy all photos to a hard drive folder, this folder should contain only the photos to be inserted into the Composite in jpg ,tiff or png format. Rename the picture files to match the name of the person photographed, including accents and spaces. a) Lastname and firstname: Put in the lastname first, then a comma (“,”) and finally the firstname, for example: William, John.jpg or Schumacher, Joe.jpg; the program orders the pictures by lastname but will print by firstname + lastname becoming William, John printed as John William. b) Firstname: Place it directly in the file name that way, for example: John William. c) If you prefer a different sorting way you may add at the beginning of the name _999_ like _005_John William.jpg, this will indicate the application to order the pictures by number ( of course numbering will not be printed in the composite). Please note: Use a # simbol for placing a new line in the text. 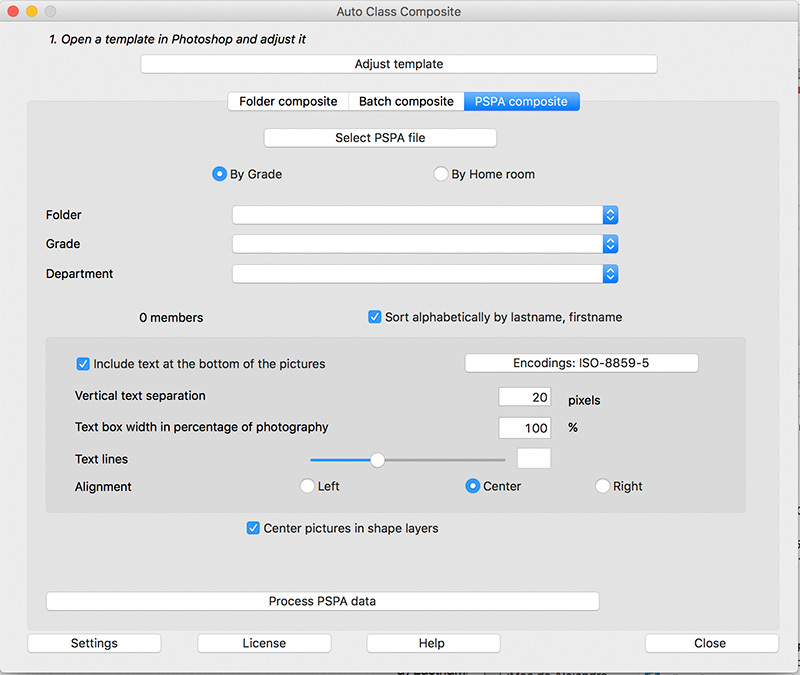 Open in Photoshop® a composite template, resize it in Photoshop or by using the Adjust template option in the application ( please remember that you have to adapt manually the composite frame to the new size). Now you have to create as many Shape layers as pictures you will add to the composite, this can easily be done with the auto layers generation option of the application ( in Adjust template), please select a shape layer in Photoshop and input the number of rows and photos by row to create, then click at Create shape layers, the application automatically creates copies of the selected shape layer and places them in the appropriate order. 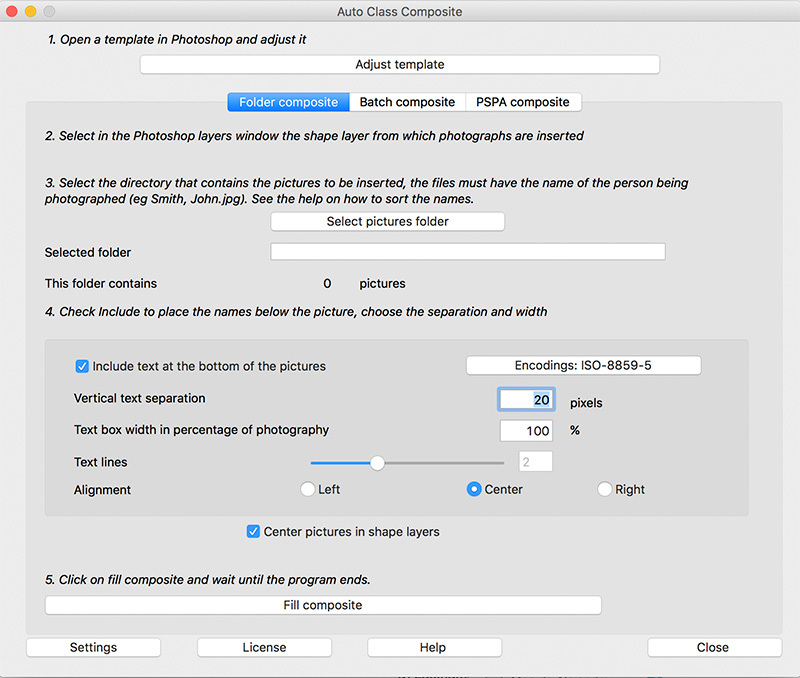 If the number of pictures is not divisible allow some more and then remove the unneeded layers in the last row at Photoshop ( please remember that you may use Photoshop’s alignment and spacing features available at the options of the Photoshop’s Move tool). The order of the layers in Photoshop layers palette ( from top to bottom) is the order used by the application to fill the composite. You can include anagrams of the school, drawings, photographs, etc., provided that the shape layers (or Formas in the Spanish version) are reserved for the application to import photos. On the application select the folder containing the pictures, the number of them will be shown. The template must have enough shape layers to contain all the photographs. Make the needed adjustments to the text at the bottom of the photographs. Click on Fill Composite and wait until Photoshop® finishes filling it. You may adjust later the text for very short or large names, please see more information in texts. The program resizes and places the pictures automatically in the predefined shapes and will place the name bellow the picture. You may apply shadow, stroke, bevel,etc effects to the pictures easily by applying this effects to the shape layer, if you apply it to the first one and then generate the shape layers the effect will be copied into all shape layers for the composite. All texts bellow the pictures are put together in Photoshop layers palette ( at top), this way you may easily select all text layers and change the font, size, etc without having to refill the composite. If using version CS2 or higher you will benefit from the multiple layer selection feature and change all at once. To design your own template you only have to take in mind that you need the same number of shape layers than pictures you will place in the composite. Therefore we have included a feature to easily copy a shape layer in a predefined number of rows and pictures per row but you need still to draw the first shape layer ( or take one from the predesigned templates). To draw a shape layer please use Photoshop’s Rectangle tool, you may select square shaped rectangles, rounded corners, ovals or even custom forms. Once your master shape layer is finished you may add an effect like a stroke, bevel, shadow, etc and finally use our integrated feature ( at Adjust template) to copy this shape layer into the needed rows and pictures per row. It’s also possible to predesign a shape layer with a mask so that the pictured person head is cut out from the background, you need to define a standard head mask for all pictures and then retouch the mask where needed. Adjust templates: Allows you to resize the template and create shape layers automatically, you must enter the number of rows and pictures per row you want. After resizing the template you will have to adapt the frame manually to the new size. Encodings: This is a new option in version 9 and allows you to set a special language encoding for your file names. Use the default ISO-8559-1 for the main languages like english, spanish, french, etc. to be used for filling a single composite document with the images from a folder. You need to select in Photoshop layers palette the first layer to be used as target for the first image, ACC will fill the composite starting at this layer and in the order of the layers palette. Select pictures folder:You have to select the directory that contains the pictures to add to the composite. The folder is selected with a double click (folder icon is open). You may save pictures of teachers and students in different folders, at the time of completing the composite simply select the first layer where starting to place pictures. Include: Indicates whether or not to include the names of the photographed persons on the composite. Vertical separation of text: Indicates the separation of the text box below each picture. Width text box: Indicates in percentage of pictures’s width the space that will hold the name. The text with the name is always centered at the bottom of the picture. Lines of text: Indicates the maximum lines to be used to insert the text with the name (does not necessarily mean that you will use these lines, will depend on the font and text to be used.) For name + surname you will get better results if selecting only 1 line. Alignment: Indicates the type of alignment of the text at the bottom of the picture. Remember that once filled the composite you can modify the characteristics of the text using the appropriate functions of Photoshop ®, if you have CS2 or higher you can apply changes to all layers at once by selecting multiple layers. Center pictures in shape layers: this option will center the picture in the shape layer and may be usefull if pictures have been take in horizontal, if not checked pictures will be aligned with the left top corner of the shape layer. Fill Composite: Places the photographs from the selected folder into the composite, starting at the selected shape layer and using the order of the layers in this palette ( from top to bottom). You may cancel the process but keep in mind that the answer will not be immediate. 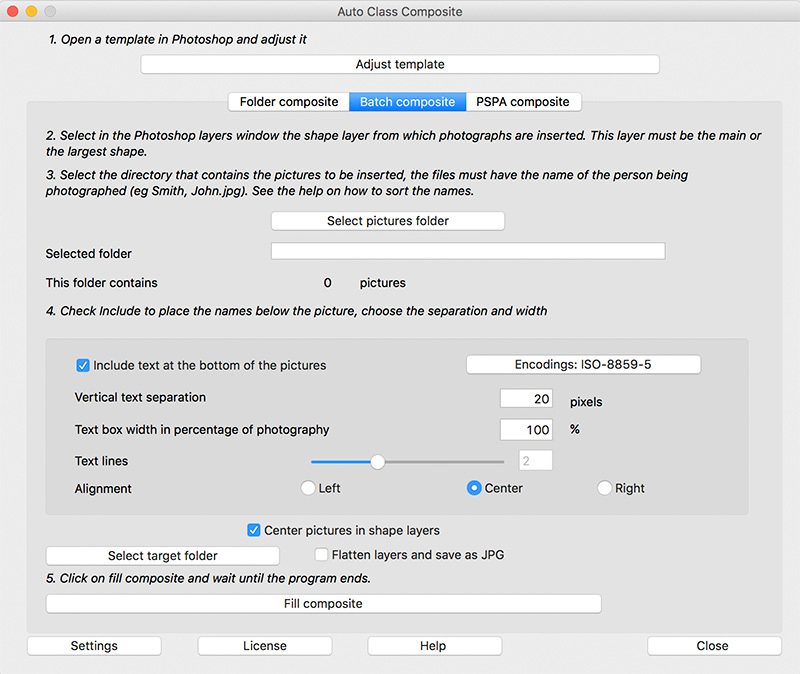 to be used for creating multiple composite files from the images in a folder, it places alternatively an image in the main layer and the rest of images are placed in the subsequent layers at Photoshop layers palette. You have to create a main image in the composite template and place at top of the shape layers (layers used as target for the images), then select this main layer. In this option you have to select also the target folder for the composite files, each file while be named with the file name of the main image on it (Do NOT select the images folder as target!! ). Please notice that you will need PSD format to be able to edit the font, size, etc. will create a composite using the data in a PSPA file. Select PSPA file: Please select the index.txt file of your PSPA data folder. Here you may select if using the data by Grade or Home room and then you will be able to select the Folder, Grade / Home room and department of the persons to include in the composite. It will show the number of members included in this selection. You may also enable sorting pictures by lastname, firstname or use the default sorting order in the index.txt file. Process PSPA data: Places the photographs from the selected folder, grade / home room and department into the composite, starting at the selected shape layer and using the order of the layers in this palette ( from top to bottom). You may cancel the process but keep in mind that the answer will not be immediate. IMPORTANT: Do not include groups in the Photoshop template, at least not between the shape layers, you should leave at least one layer before and after the shape layers.